Size also matters at our first stop: Cabela's, a 180,000-square-foot outdoor-sporting-goods store with a big-game trophy collection. Cabela's is like a zoo where the animals are not only dead, but also impersonating Jackie Chan. Someone has arranged them in dramatic reenactments: A crocodile's jaw clamps a wildebeest's neck, a leopard chases a baboon atop the trees, a zebra kicks a lion in the face. Lawrence, about 40 miles west, is a cute college town, home to the University of Kansas's main campus. We go to lunch at Jefferson's, a boisterous diner with dollar bills thumbtacked to the walls. I order buffalo wings, which come slathered in a tangy hot sauce; the chicken's so good, I don't mind that eating it demands an entire roll of paper towels. We have a lot of ground to cover today, so after strolling along the main drag, Massachusetts Street, we set off for our evening's destination, Cottonwood Falls. The 900-person ranching community is in the Flint Hills, a region of rolling hills in the high prairie. Pulling into the town's center, we immediately notice horse manure in the middle of Broadway. I'm charmed to realize there really are some places where people still ride horses down the main street. We peek into the front window of the Emma Chase Cafe, a restaurant with plaid tablecloths. As we walk away, a lady runs out, yelling, "You know there's live music tonight, right?" We tell her that we'll definitely be back. I had made us a reservation at Clover Cliff Ranch Bed & Breakfast, a 146-year-old ranch/inn in Elmdale, seven miles west. Joan Donahue, Clover Cliff's sweet-faced septuagenarian owner, bought the 5,000-acre property with her husband Jim in 1987, and they opened the B&B six years later. She shows us around the Main House--a four-bedroom limestone building with a music room where, the Donahues claim, Jesse James once slept. Joan and Jim don't live on the ranch, so she points out emergency numbers posted by the phone and takes off. Although we'd booked a bedroom with a shared bath, we're the only ones staying at the B&B, so we have the run of the place. The first thing we do is leave to watch the sunset. Like a watercolor streak, a rainbow touches down in a prairie across the interstate. The only restaurant open for dinner is Cottonwood Falls' Grand Central Hotel and Grill, an upscale brick-faced restaurant that I'd heard has the best steak in Kansas. Patrick orders a flame-grilled fillet of beef tenderloin. His large steak isn't very juicy, but the meat is so tender, a mouthful nearly melts. I want to see if they also have the best pasta in Kansas, so I pick the pasta "lemonada": fettucine with sun-dried tomatoes, mushrooms, and broccoli in a white wine and lemon sauce. Stick with the meat. Overall, the bill totals $50 without tip, which seems overpriced for a town that has horse dung on its main street. Patrick and I wake up to an elaborate meal of scrambled eggs, sausage links, frosted lemon bread, toast, juice, and coffee--all prepared by Joan and served on a sunlit veranda. Over breakfast, Jim offers us a tour of their land on his off-road 4x4. I wouldn't expect bumping around treeless green pastures to be all that exciting, but the two hours we spend cavorting on Jim's lumpy fields end up being incredibly fun. We encounter mating cattle. ("They don't have much manners, do they?" says Jim.) We tease a lone bull, safely restrained behind a fence. And at one point, coyotes--"ki-yotes" in Kansan--cry in the distance. When Patrick notices one scrambling up a hill, Jim slams on the gas. We chase after the coyote at full speed until it escapes over the crest. The Clover Cliff Ranch B&B is a few miles from the Tallgrass Prairie National Preserve, an 11,000-acre national park devoted entirely to grass. The name, as it turns out, is false advertising in May. The grass is tall--if you're an ant. The park truly earns its name in the autumn, when the grass reaches between three and six feet. A bus tour runs through the grounds three times a day April through October. It couldn't possibly surpass our morning adventure, however, so we visit an information booth/barn where our favorite Emma Chase violinist, Lucy Smith, pops up yet again (she's a park volunteer). It's lunchtime when we arrive at Council Grove, a town of 2,300 with a buffalo mural painted on City Hall. Hays House, founded in 1857 by Daniel Boone's great-grandson, bills itself as the oldest continually operating restaurant west of the Mississippi. I order skillet-fried chicken, which is crunchy, but a little dry. Patrick's chicken club sandwich, on the other hand, is a winner. We cross the street to the Aldrich Apothecary, an old-time drugstore/soda fountain, for a chocolate ice-cream soda. A few hours later, we make it to Wilson. The town has a lot of rusty silos and abandoned storefronts, and we're a little spooked. The Midland Hotel was nicely renovated in 2003, but even it's sort of eerie. After a dinner of beers and a ham and cheese sandwich in the hotel's basement tavern, a local whispers that the inn has a history of strange occurrences. Legend has it that a former owner hanged himself in the main stairwell after he accidentally killed his son in a shoot-out. We think the young woman is teasing us, especially when she says that the third floor--where we're staying--used to be a chicken coop. But later, when I check the hotel's website, I find some of what she was saying confirmed. I'm too freaked out for bed, and the only place open after midnight is Al's Bar & Grill, a cavernous dive decorated with a collection of wheelchairs. The bartenders' T-shirts relay important information: Tomorrow, Al's will hold its eighth-annual Testicle Festival. As far as I can tell, everything in Kansas shuts down on Sunday mornings, so we spend the first part of the day relaxing in the sun, watching people fish in Wilson Lake, which locals know as "the clearest lake in Kansas." Dinsmoor's eccentricity inspired other townsfolk, which is how Lucas became the grassroots art capital of Kansas. We browse the Grassroots Art Center, an outsider-art outpost featuring pieces like a silver car fabricated entirely out of pull tabs. 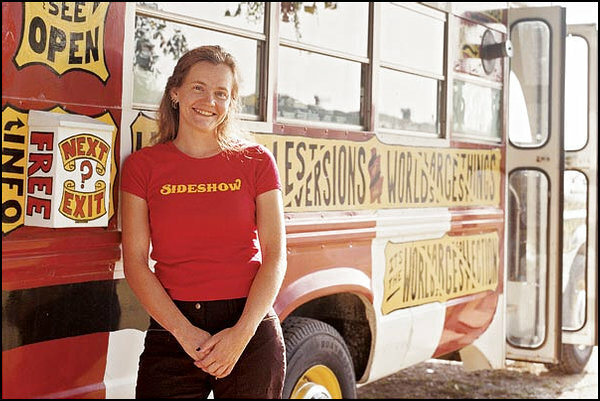 Next door to the Garden of Eden, 33-year-old artist Erika Nelson has a traveling museum parked in front of her home. She calls it The World's Largest Collection of the World's Smallest Versions of the World's Largest Things, the apotheosis of superlatives. Nelson has built hundreds of miniature versions of objects like the World's Largest Ball of Twine (also in Kansas, of course), and she makes pilgrimages around the country to photograph her versions beside the originals. We backtrack south to Al's for the Testicle Festival. The place is jammed with locals heaping their plates with fried bull testicles. Each one is round and flat, the size of a potato chip. Dipped in barbecue sauce, they aren't half-bad, in a livery, schnitzelly kind of way. Animals--dead and alive--seem to be a running theme, so we choose to embrace it. Hedrick's Bed & Breakfast Inn and Exotic Animal Farm in Nickerson is a zoo-like establishment where the vast menagerie includes zebras, camels, and llamas. We're an hour late for the early-evening check-in; a note at the information desk instructs us to find someone to help us over in the kangaroo barn. Each room has a theme, and we're booked in The Bird of Paradise Suite--two adjoining rooms, one with birds and a waterfall painted over the Jacuzzi and the other with a county fair motif. The inn reminds me of a summer camp; common areas are off-limits after 9:30 p.m. Sadly, by the time we get there, the dinner hour is long past, and we don't fare well finding food in town. A gas station is the only business that's open for miles. Oh well. We check out City Slickers--it seems totally appropriate--from the B&B's video library and call it a night.